You need your character to unexpectedly drop dead, with no warning. You need a good, plausible medical reason for this to happen. Note: It might help to review “I ❤ the Lub-Dubber”, the post about the cardiovascular system. Here are six medical conditions that could cause your character to suddenly drop dead. What it is: The aorta is the main artery that leads out of the heart. Like all arteries, its walls are made up of multiple layers. Sometimes, a tear occurs in the inner layer. This allows the high-pressure blood in the aorta to push itself in between the layers, “dissecting” the inner layer away from the other layers. Why the character will die: There are a couple of problems that this can cause. A main one: the flap of the inner layer can cover up the openings to arteries that lead out of the aorta. This can lead to ischemia (oxygen deprivation) of whatever was at the other end of the artery, including the brain or even the heart itself. Make it plausible: Your character probably has high blood pressure. They might describe a sudden onset of incredibly severe, “tearing” chest pain, which classically radiates to the back. 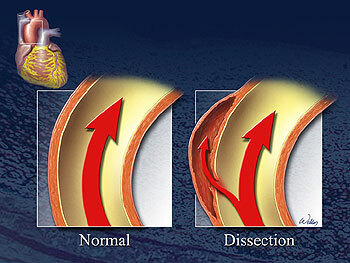 What it is: A genetic disorder of the heart muscle causes the walls of the left ventricle to get really big and thick. 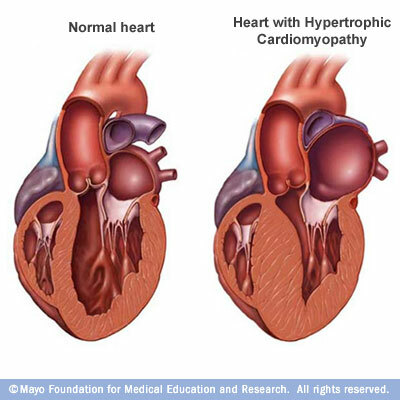 (hyper = over/above, troph = grow, card = heart, myo = muscle, path = feeling/suffering). Why the character will die: There are a number of ways this can cause problems. (1) In one set of problems, the passage to the aorta (also known as the left ventricular outflow tract) gets blocked by the oversized walls of the left ventricle. No blood gets out of the heart, and therefore nothing in the body can get oxygen. This may happen when they’re at rest, but more often happens when they’re exercising. (2) The electrical system of the heart may be out of whack; that would make it prone to arrhythmias. (See the section on Cardiac Arrhythmia) (3) The heart muscle itself could be less-than-functional: either it doesn’t pump well, or it’s bad at relaxing so it can’t fill up after it pumps. Make it plausible: Your character is a young, fit athlete. He or she suddenly drops dead while exercising. A member of their family (a parent, for example) may have died suddenly due to the same reason. What it is: Something blocks off the circulation of blood into the lungs. (Pulmonary = lungs; Embolism = the blockage of a blood vessel with some kind of material.) It’s often a blood clot, but it can also be fat, air, or even tumor material. Why the character will die: The blood will get backed up from the blockage. This causes a severe drop in blood delivery (measured by blood pressure) to the body, with an increase of pressure behind the blockage. This can cause failure of the right heart (which can’t pump against that kind of pressure). No blood oxygenation, and compromised circulation. Bad news. Make it plausible: Emboli that come from blood clots are often from deep vein thromboses, or clots that form in the deep veins (often of the legs). There are some risk factors which make it more likely that your character may develop a pulmonary embolus. These include recent immobilization, recent surgery, stroke, paralysis, chronic heart disease, and cancer. Your character may be obese, may have high blood pressure, and may be a smoker. What it is: A disturbance in the electrical pathways in the heart. 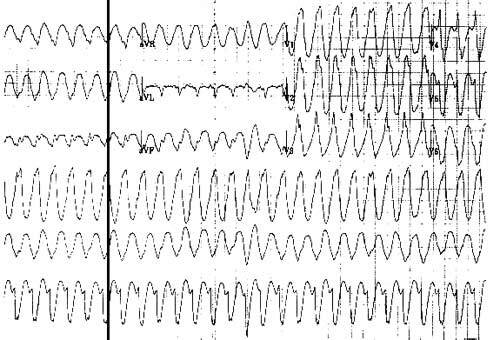 This can cause the interruption of proper coordinated pumping in the heart muscle; some arrhythmias can lead to sudden death. Why the character will die: The pumping of the heart muscle becomes uncoordinated. This results in inadequate filling and/or emptying of the chambers of the heart. Which means that the heart can’t properly pump blood out to the rest of the body. Which means the rest of the body doesn’t get any oxygen. Make it plausible: There are a LOT of reasons why people get arrhythmias. Everything from being born with extra pathways that run the electrical activity of the heart in a circle, to the sequelae (after-effects) of a heart attack, to drug toxicity, to irregularities of ion flow in the cells of the heart. Research is your friend in this case. 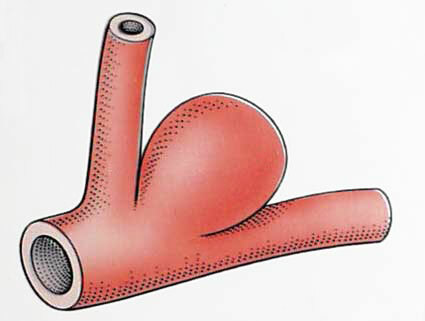 …develops an out-pouching called an aneurysm. Your character may have been born with it, or they may have acquired it at some point during their life. The acquired ones seem to be more likely to cause problems. Why the character will die: The aneurysm itself probably doesn’t make much trouble…but it runs the risk of bursting, causing a major brain bleed. The resulting bleed is called a sub-arachnoid hemorrhage, after the space that your character bleeds into. Note: I hyphenated “sub-arachnoid” to make it easier to read and understand. (sub = under, and “arachnoid” refers to the arachnoid mater that surrounds the brain tissue.) It’s usually written as “subarachnoid”. 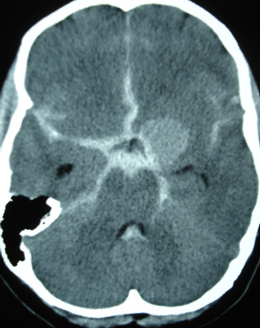 Sub-arachnoid hemorrhages are dangerous; around 50% are fatal. See that white starfish shape in the middle of the brain? That ain't supposed to be there. That's blood in the arachnoid space. Seeing that on a head film would sure squeeze the heck out of your adrenals (as my cardiology preceptor would say). Make it plausible: Your character will likely have high blood pressure, and will probably smoke cigarettes. Your character may also be a heavy drinker. A family member (parent, sibling, grandparent) may also have died suddenly from the same cause, but not always. Are there any that AREN’T cardiovascular? Cardiovascular causes do seem to be pretty prominent, don’t they? 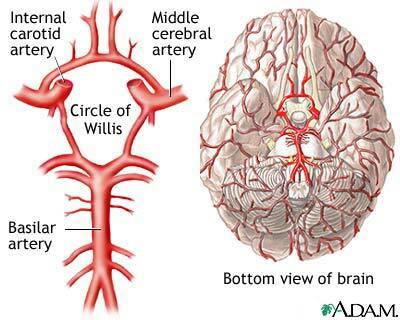 Strokes, aneurysms, emboli, heart attacks…they all have to do with the heart and blood vessels. The only non-cardiovascular cause of potentially instant-ish death I can think of off the top of my head is anaphylaxis. Which, um, has a cardiovascular cause of death. ::sigh:: I’ll include it anyway. Why the character will die: There are two main problems that may result in death from anaphylaxis. (1) There is a certain balance of where the fluid in your body likes to stay, be it in blood vessels or in the general body tissues. In anaphylaxis, there is a massive shift of fluid out of the blood vessels and into the body tissues. That results in the compromise of the cardiovascular system (can’t escape it, can we? ), which endangers the perfusion of oxygen to the brain and tissues. (2) There is a significant amount of tissue swelling involved, and this can extend to the breathing passages. This results in a blockage of the airway. That means that the character will not be able to get enough air into their lungs to properly oxygenate their blood. And you have the same problem. –Adolescents and young adults are at most risk of death from food reactions. Last note today, I promise: Any one of these can be fatal or not, depending on the person and the situation. Sell it how you want to sell it, but make sure you set up the situation properly for plausibility purposes. The contents of this site, such as text, graphics, images, and other material contained on the Site (“Content”) are for informational purposes only. The Content is not intended to be a substitute for professional medical advice, diagnosis, or treatment. Always seek the advice of your physician or other qualified health provider with any questions you may have regarding a medical condition. Never disregard professional medical advice or delay in seeking it because of something you have read on this Site! If you think you may have a medical emergency, call your doctor or 911 immediately. This blog does not recommend or endorse any specific tests, physicians, products, procedures, opinions, or other information that may be mentioned on the Site. Reliance on any information provided by this blog, or other visitors to the Site is solely at your own risk. If you use this as if it were real medical information, these posts will be published by dead drop. You probably don’t have access to the drop point. Wanna Help A Wheelchair Fencer Compete? Because There Were Awesome Parts of College That I Miss Sometimes…..